There is a small church near where I live that frequently display various messages that are easy to read while driving by. I am grateful that this signage is simple and direct. A message we should all reflect on personally, to see if Christ is truly in our Christmas. There continues to be an aggressive push to remove Christ from Christmas and replace it with a broad and general greeting for the season, which severely takes away from the meaning of Christmas. I know of a friend of mine, whose mother will always say, "Merry Christmas" to people as they leave the store where she works. She will not be politically correct with people for the sake of offending someone. I am the same way too and I have yet to hear someone be offended, in fact, they are quite happy to hear someone say "Merry Christmas" to them. Just as a person can choose to be as general as they want in acknowledging to others, "Happy Holidays," so too can a person be as specific to everyone by saying, "Merry Christmas!" Christmas is about the birth of Jesus Christ. As a Christian, I feel it is important to acknowledge those whom I know who are Jewish, wishing them a Happy Hanukkah at this time of the year. Why should I take away from their celebration of any Jewish holiday, just to be politically correct? It is as important to them as any celebrated Christian holiday is to me. 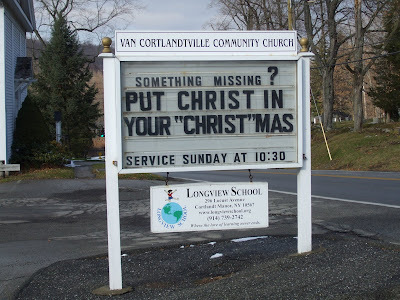 So, where is Christ in your Christmas this year? "For I am not ashamed of the gospel of Christ, for it is the power of God to salvation for everyone who believes, for the Jew first and also for the Greek." Romans 1:16, NKJV. Amen Kurt. Let's not forget that without Christ there would be no Christmas. It's upsetting to see when well meaning people put an "x" thru Christ and call it "xmas". God Bless you my friend. I've been praying for you each morning. Thank you for the picture of that sign. I used to love reading as I would go to Home Depot or the supermarket. I agree that far too many people are so quick just to say happy holidays. I have been guilty of that myself. I think it is another ploy to make us feel oppressed and boxed in. I continue to remind those around me of what Christmas is all about. Thanks for the reminder of who is at the center of it all. Merry Christmas Kurt, as we celebrate the birth of our Lord and Savior. I too make sure Christ is in the center of all my Christmas greetings. You are continually in my prayer and I do pray that things are well.